One of the most popular quotes of all time about LOVE is from the bible in Corinthians 13:4-7 which begins with “Love is patient, love is kind…” I find it so very interesting that the very first word used to describe love in this well known verse is the word patient. When I look up the word patient in the dictionary this is what I found – “able to accept or tolerate delays, problems, or suffering without becoming annoyed or anxious”. I was born in the month of May and my horoscope is Taurus. One of the character traits we are known for, is lack of patience. Over the years, I can see my own growth in this area. In the past I used to just cut people out if they weren’t giving me what I wanted. It took some maturing for me to realize I was really just cutting myself off from some wonderful experiences and if I just allowed others to be who they are, I would see a different result. Sometimes that is really rather difficult especially when you can see things in others that they are unable to see for themselves. I am learning to have patience. It’s like a muscle and with practice we can develop it and it becomes stronger over time. I have realized when we have patience it helps us to grow. I feel in today’s society, as a whole, there is a tendency to discard people and relationships much too quickly. If a challenge arises, I agree that it would be nice sometimes to just walk away and not have to deal with it. However, in order to CREATE GREAT LOVE in our life I am certain that having patience is a key ingredient. I encourage you to practice some patience this week. You know in your heart when something is worth waiting for. 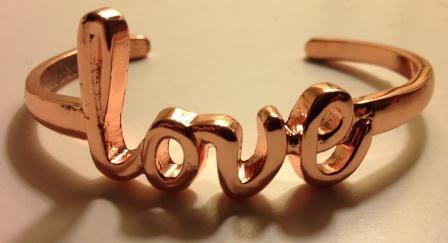 My picture this week is a bracelet I saw in a store and bought for myself. Now every time I look at my wrist I am reminded simply to LOVE. This entry was tagged Bible, Bible Verse, Corinthians, Create Great Love, Horoscope, Love, Love Bracelet, Love is Patient, Patience, Relationships, Sholem Aleichem, Taurus. Bookmark the permalink.